Being one of the leaders in fraud prevention and examination services, Farhat & Co. can help you build Fraud Prevention System. Professional certified fraud examiners and a reputation for quality service can certainly provide you with an assurance that we are skilled in this field and a lot more. We are expert in forensic audit and a regulated expert by Dubai Courts, Dubai Prosecution, Abu Dhabi Courts and Prosecution, and Sharjah Courts and Prosecution. We also make certain that you are aware of the damages of the fraud and evaluate exactly how much. And even willing to conduct a business valuation with your request. What is Forensic Accounting and Fraud Examination? Fraud may not be obvious at all times regardless if your financials are handled properly. The protection of a company’s financial interests and assets is an imperative action that any businessman should take. You can call on us for forensic accounting and fraud examination or forensic audit services at any time but it is also better to have practices that can prevent fraud from occurring. Preventive measures should be established and swift actions against fraudulent activities must be available at once. In general, financial examinations are about the identification and prevention or discouragement of fraud schemes that might be happening inside an organization may it be known by others or not at all. There are a multiple investigations that we can do for you if there are concerns regarding fraud in your company or if you have discovered it yourself already. We are expert in forensic audit and a regulated expert by Dubai Courts, Dubai Prosecution, Abu Dhabi Courts and Prosecution, and Sharjah Courts and Prosecution. We also make certain that you are aware of the damages of the fraud and evaluate exactly how much. And even willing to conduct a business valuation with your request. You can call on us for forensic accounting and fraud examination or forensic audit services at any time but it is also better to have practices that can prevent fraud from occurring. Preventive measures should be established and swift actions against fraudulent activities must be available at once. In general, financial examinations are about the identification and prevention or discouragement of fraud schemes that might be happening inside an organization may it be known by others or not at all. There are a multiple investigations that we can do for you if there are concerns regarding fraud in your company or if you have discovered it yourself already. To pinpoint the existing fraud that is currently going on in your business, we can trace where your money is going, which can even help in preventing future fraudulent acts that could possibly happen when actions are not taken immediately. Our services do not just limit with the above since we ensure that every document for certain events that are taken into account with regard to the movement of money during the alleged crime is checked and assessed to ensure where the money came from, went, and its current place. We also make certain that you are aware of the damages of the fraud and evaluate exactly how much. And even willing to conduct a business valuation with your request. By letting us work with you and availing our services, we ensure that your organizations’ internal controls that can identify potential weak spots where fraudulent acts can enter are efficient enough. We also see to it that fraud won’t transpire in your organization in the first place. Being one of the leaders in fraud prevention and examination services, Farhat & Co. can help you build Fraud Prevention System. Professional certified fraud examiners and a reputation for quality service can certainly provide you with an assurance that we are skilled in this field and a lot more. We are expert in forensic audit and a regulated expert by Dubai Courts, Dubai Prosecution, Abu Dhabi Courts and Prosecution, and Sharjah Courts and Prosecution. Certified fraud examiners are knowledgeable when it comes to dealing with forensic audit, fraudulent transactions, and legal matters. Our fraud investigator team is detail-oriented when it comes to issues in businesses, discovering unethical doings, such as corporate fraud and accounting fraud, and making sure it won’t happen again. 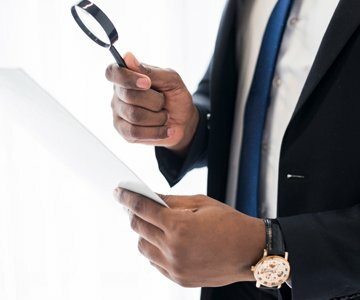 Since we give importance to the way you value your business, our certified fraud examiners are conducting our examinations and forensic audits based on the highest standards in the world, professionally managing your case and identifying your issues to provide solutions with as so much quality as there should be. Our credibility and integrity always lie in our team that is composed of well-experienced certified fraud examiners and Certified Public Accountants who are accomplished in their profession, working with passion in discovering fraudulent acts and criminals. Our team, which is full of certified fraud examiners who are specialists in the field, has a full-range of knowledge and even tools for the detection of fraudulent conduct. This especially includes the analyzation of documents, managing interviews with witness, and having secret methods and investigation techniques of forensic accounting.Our experience that spans for more than 30 years do not only focus on this service but on various ones that you can avail anytime, such as trademark registration in Dubai and also processing the deregistration of company. consultation with regard to the impending VAT in UAE with our CPAs in Dubai who manages our bookkeeping and accounting services and as well as our payroll and HR solutions that we provide to companies. These same CPAs in Dubai work hand-in-hand with our auditors for Owners Association in Dubai because we are also one of the top auditing firms in Dubai. We also handle project developers audit among the aforementioned audits. FAR – Farhat & Co. has designed its framework in solving issues to better serve organizations in making their company secure, risk-free, efficient, and profitable. We are capable of detecting anything that is not in-line with ethical standards, which is a variety of fraudulent activities, conducting our examination with professionalism and ethics to uphold our standards as well as yours. Our innovative uses of technology with electronic data in resolving issues and cases gives us the advantage of lessening the time and resources that are being spent on investigations. The necessary software that is needed to further advance in uncovering cases is also in our hands, serving as our technique that helps us in each issue that we face. Certified fraud examiners are knowledgeable when it comes to dealing with forensic audit, fraudulent transactions, and legal matters. Our fraud investigator team is detail-oriented when it comes to issues in businesses, discovering unethical doings, such as corporate fraud and accounting fraud, and making sure it won’t happen again. Since we give importance to the way you value your business, our certified fraud examiners are conducting our examinations and forensic audits based on the highest standards in the world, professionally managing your case and identifying your issues to provide solutions with as so much quality as there should be. Our credibility and integrity always lie in our team that is composed of well-experienced certified fraud examiners and Certified Public Accountants who are accomplished in their profession, working with passion in discovering fraudulent acts and criminals. Our team, which is full of certified fraud examiners who are specialists in the field, has a full-range of knowledge and even tools for the detection of fraudulent conduct. This especially includes the analyzation of documents, managing interviews with witness, and having secret methods and investigation techniques of forensic accounting.Our experience that spans for more than 30 years do not only focus on this service but on various ones that you can avail anytime, such as trademark registration in Dubai and also processing the deregistration of company. consultation with regard to the impending VAT in UAE with our CPAs in Dubai who manages our bookkeeping and accounting services and as well as our payroll and HR solutions that we provide to companies. These same CPAs in Dubai work hand-in-hand with our auditors for Owners Association in Dubai because we are also one of the top auditing firms in Dubai. We also handle project developers audit among the aforementioned audits. FAR – Farhat & Co. has designed its framework in solving issues to better serve organizations in making their company secure, risk-free, efficient, and profitable. We are capable of detecting anything that is not in-line with ethical standards, which is a variety of fraudulent activities, conducting our examination with professionalism and ethics to uphold our standards as well as yours. Our innovative uses of technology with electronic data in resolving issues and cases gives us the advantage of lessening the time and resources that are being spent on investigations. The necessary software that is needed to further advance in uncovering cases is also in our hands, serving as our technique that helps us in each issue that we face.